We’re excited to share a recent interview we did with Dr. Douglas Erickson. Doug’s book, Living the Future, was recently released and is excellent. He earned his Ph.D. in Systematic Theology from Marquette University. He wrote his dissertation on the kingdom of God and the work of the Spirit in the Vineyard Movement. Doug also serves on the curriculum committee for Vineyard Institute, the premier education arm of the Vineyard. Doug and his wife Sandi have been in the Vineyard Movement for 25 years. They are currently members of the Vineyard Church in Duluth, MN where they live with their three children. Doug has taught and worshipped in Vineyard churches all over the Midwest, but he loves visiting Vineyard churches…especially those with trout streams nearby. T.T. : What inspired this project? D.E. : A number of years ago, when I just started my doctorate, I knew I wanted to do something that would serve the movement- that would be helpful for the Vineyard. So I contacted everyone I knew that was a leader or pastor in the movement, and basically said “hey, I’m in this Ph.D. program, in the near future I’m going to have to write a dissertation, and I want to do something that will serve the movement. What do we need?” One of the first responses I received was from Derek Morphew, who suggested the topic of the relationship between the kingdom of God and the work of the Spirit. We discussed this idea, and that’s what I went with. Derek’s become a dear friend in the years since. T.T. : Why a study of pneumatology and the kingdom of God? D.E. 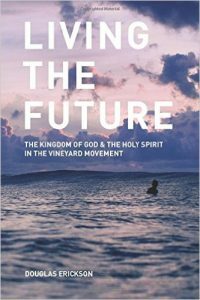 : I think most Vineyard people know about our theology of the kingdom, the already-not yet, that’s been taught and discussed by Wimber, Don Williams, Alexander Venter, Derek, etc. What isn’t so clear is how that theology could (or maybe should) and does affect our praxis- what we do every day in our following Jesus. I think that every practice has a theology of some sort underlying it, whether we acknowledge it or not. The question is, what is that theology? So in our case in the Vineyard, I focused on a few elements of the work of the Spirit- things like healing and prophecy that we are known for. So the question becomes, how does our commitment to the already/not yet affect the way we pray for healing? Should it? How did John Wimber think of this? What about Vineyard teachers other than Wimber, up to the present day? When you look at these things, you find that John WImber really did have a pretty developed theology of healing, etc. The Vineyard “DNA” that is often is talked about really does cover both theology and practice – not just the “how” we pray for the sick but the “why” and the ways in which the theology, values and practices all go together. T.T. : So is this book about the Vineyard primarily, or John Wimber? D.E. : (Laughs). Good question. It’s both really, in that even if the main idea is to help the Vineyard, you can’t really understand the Vineyard without having a real good understanding of John Wimber. I mean, he was so influential- sure there were a lot of folks around in the early days that led, prayed for people, developed the values, etc. – people like his wife Carol for sure, but Bob and Penny Fulton, Carl Tuttle, and many others- but John was really the unquestioned leader. When the groups started growing, new leaders were attracted to John and Carol and often bought in to the whole program, but John was the guy. And for the first 20+ years of the vineyard, John was the unquestioned leader and his personality and charisma contributed so much. But on the other hand, the Vineyard is much bigger than John. He’s been gone since 1997, so we’ve almost had as much time without his leadership as with it. A lot of people wondered, in and out of the Vineyard, what would happen to the movement once John was no longer around to lead. Turns out, we were just fine. (laughs) The amazing job John did of identifying and training leaders meant that the movement had plenty of leadership depth to turn to- and a real pipeline of smart, committed, Jesus-loving folks that could step up. So there has been change and development in the movement for sure. T.T. : You’ve mentioned several times the idea of the “DNA” or “distinctives” or things that make the Vineyard unique. Is there a danger or caution when elevating a movement or a group like their “all that” and doesn’t that mean at some point, you have a higher view of the Vineyard than other movements or denominations? D.E. : Well, I suppose there can be a danger, sure. But on the other hand, I think the distinctive are worth holding on to. D.E. : Yeah, for sure that’s a temptation that we probably all might fall into. I really like the way Wimber put it once: he likened the church to “God’s Stew”. He was really good at putting together these homespun, plain analogies that really work. A stew is a mixture of veggies and meat, right? Well, Wimber used to say that we, as the Vineyard, are just one veggie in the stew. We contribute a unique taste, texture, color etc. to the dish, but all the other veggies, meats and spices do as well. Apparently, God really likes flavorful, colorful stew! The stew without our flavor is missing something. But at the same time, a bowl of carrots isn’t a stew- it’s a bowl of carrots. So we don’t expect everyone else to be like us either. They contribute their smells and flavors, and we contribute ours. It all makes for a better church, a church (in the big sense) that reflects God’s glory and diversity better. T.T. : Yeah, I really like that analogy too. So it’s not about us in the Vineyard thinking we are better, more biblical, or whatever compared to other churches, it’s about how we see ourselves. D.E. : That’s exactly right. It’s being who God has called us to be- maintaining our DNA to keep our flavor going. Other groups or churches see things differently, and that’s ok. T.T. : So what are these distinctives? What does set the Vineyard apart? D.E. : Well, I think I try to lay some of that out in the book…so…buy the book! But overall I think it can be boiled down to this: the tension of the kingdom of God that is here, but not fully here, impacts everything we do. How we pray for the sick. How we experience prophecy. How we worship. EVERYTHING we do in our life of following Jesus (and our entire experience in the world really!) is shot through with this reality of a kingdom that is “in the process of realization” as Jerimias put it. The thing is, that tension is really hard. Most of us don’t like tension –we like calm, resolution, certainty, predictability. But part of our Vineyard DNA is NOT always resolving that tension – to live in it, to accept that we don’t always have the answers, don’t always experience the best things. So that brings in things like suffering, unanswered prayer, etc. T.T. : The “not-yet” side of things. D.E. : Yup. When you look at the church historically, you see this pattern of already and not yet. Big revivals, followed by hardship or persecution. In church history, sometimes persecution has lead to revivals and big works of God, and sometimes it has wiped out the church witness in an area or people. We shouldn’t be surprised by this- our boss said “in this world you will have trouble” , but at the same time we are commanded to pray for the sick. Tension. It can be really, really hard, but in a sense, we don’t have a choice. T.T. : Don’t have a choice because that’s just the way things are. D.E. : Yeah, exactly. It’s the reality of the world we live in. T.T. : That’s a tough message in some ways. D.E. : Oh for sure. But it’s also honest. Every pastor experiences this- the highs and the lows, a person living a destructive life who suddenly turns to Jesus and is completely changed. But maybe at the same time, someone else in your church gets a cancer diagnosis. Or a strong leadership couple goes through a messy divorce. It’s reality. It’s hard, but we are commanded to live IN THAT reality –to have hope, to continue to pray for the sick, even if we see little results at times. Because we know, that the Spirit IS alive and active and does move- and we should expect that as well. Wimber experienced this over and over- from the very early days of when they started praying for the sick- especially in when he lost his dear friend Canon David Watson to cancer, whom he had prayed for many times. So yeah, the tension is hard. But we do nobody any favors when we present just one side of the tension – either the already or the not yet. T.T. : Because it’s unbalanced scripturally. D.E. : Yes, and it’s, in a sense, the easy cop out. That’s why you find many churches on the one side or the other- it’s easier, in a sense, to just give up on the “already” and really lower your expectations, and present a “just hold on” picture of the Gospel. But that can be really defeating, and lead to a life without much hope, so gets unbalanced that way. We can get off the other side to- embracing the “already” and forgetting about the “not yet”. So we miss the opportunity to grow through suffering, or meet people with chronic pain or heartbreak. So in the Vineyard, we struggle to maintain that tension- to not give in to either side. T.T. : It’s not a full picture of the Gospel. D.E. : No, it isn’t for sure. We pray for and expect physical healing, but we know from the scriptures that God isn’t primarily interested in our “well being” especially in the sense we think of it in America –prosperity, perfect health, influence, all of that. God is primarily concerned with conforming us to the image of his Son, and sometimes he uses suffering and hardship to accomplish that. He did in John Wimber’s life, who struggled with heart disease, cancer, all kinds of physical ailments, not to mention the personal attacks he received from other Christians and the media. T.T. : This was a long project, and im sure you learned quite a bit along the way. What surprised you about the Vineyard, JRW, etc.? D.E. : Wow…how much time do we have? I thought I knew the Vineyard pretty well, and knew Wimber pretty well, but I learned so much. I had the opportunity to speak personally with some of the folks who were there in the beginning- who had seen all the various changes and ideas that John went through. So that was all invaluable. I guess so much of what surprised me or I learned was just about John Wimber. He truly was an amazing person. He had this amazing ability to hold conflicting or seemingly conflicting ideas in creative tension – was really a genius in that way. T.T. : So he was theologically innovative? D.E. : I don’t know if I would say that. He was innovative when it came to praxis for sure, or church structures, church growth, all that stuff. Theologically I would say he was more an integrator- taking existing materials and ideas and combing them in new ways. That’s something that really amazed me. For an “untrained” guy, (at least from an academic standpoint, he only had a few years of bible school) he had the ability to process tons of information, distill the important elements, and then combine them into his practices and values in a way that makes sense. T.T. : Can you give us an example from the book? D.E. : Sure- there are many examples… one would be James Kallas, the Lutheran theologian. A number of folks have pointed out how influential Kallas was on Wimber, and that’s true to an extent. But when I hear people say this, I often wonder if they themselves had ever read Kallas. Because Wimber certainly did, and cited him a number of times in his books and materials. But the interesting this is this: Kallas and Wimber had very different understanding of the gospels, and the ministry of Jesus. D.E. : When you read Kallas, for example, he makes it clear that Jesus saw his whole ministry as a direct frontal attack on the kingdom of Satan. Kallas establishes this in a few of his books. This idea really resonated with Wimber. However, it’s not actually clear whether Kallas actually believed there was such a thing as Satan or demons. He’s primarly arguing that this was the worldview of Jesus and Paul, and so to understand Jesus and Paul you have to understand how they saw reality – as a battle between the kingdom of God and the kingdom of Satan. But Kallas’ view on this reality, is much more muted. T.T. : So Wimber “ate the meat and spit out the bones” with Kallas’ theology. D.E. : Yeah- another one of Wimber’s sayings. That is it exactly. Many practitioners would have dismissed Kallas’ work as too liberal, too skeptical, unhelpful, etc. but Wimber took what he could, used Kallas’ insights to support his own theology of ministry, and didn’t worry too much about some of Kallas’ conclusions. I discovered that over and over again with Wimber- even with thinkers like George Eldon Ladd, who most people know was a major influence. T.T. : Interesting. I’m looking forward to reading what you have to say about that. How can people buy your book? D.E. : It’s on Amazon (order here), both print and kindle.